A $92 million investment in North Portland. Roosevelt High School is one of three high schools that are being modernized as part of the 2012 School Building Improvement Bond. The construction crews are working on finishing up Phase 3 of Roosevelt's modernization project. They are busy landscaping the front of the 1921 building with new trees, bushes, and grass and finishing up the large bio-swales and covered bike racks. The Autoshop building at the North end of the site has been completely demolished and hauled off site. The baseball/softball field is getting new dugouts, backstops, and other equipment. Some of this work will continue into the Spring, but will be ready for the first league game. Roosevelt students are taking advantage of the new facilities that were made possible through the 2012 Bond. Theater students are performing on the new stage, engineering students are battling with robots and CTE Construction Class students are learning building skills. Work on the 1921 building is now complete and active construction on Roosevelt's buildings has come to an end. The Historic 1921 building is fully modernized and ready for use. The main entrance and administration offices have returned to their former places. The expanded Commons area and Commons Courtyard are complete. Also added are 19 additional classrooms, 3 New Science labs, several new offices, a new Head Start Day Care, a security office, and a shared-use computer lab. The beloved clock tower has been given a full makeover and will once again be a functioning timepiece. The school is now fully modernized. Phase 3 site work and landscaping will continue for a few more months. Work on the historic 1921 building, Phase 2 of Roosevelt’s modernization, is nearing completion. Along with a new roof and refurbished windows, the iconic clock tower is getting a makeover. On the inside, classrooms, labs and community spaces on all three levels are getting finish painting, flooring, carpentry and electrical work. Furniture is being moved into the science labs. In the fall the student commons will expand inside of the building while outside, a new Commons Courtyard will open. Finishing on the courtyard is underway with bricks from the old cafeteria being recycled for use in an architectural feature in the new courtyard. The 3rd phase of the modernization of Roosevelt, which involves site work, landscaping and the demolition of the old cafeteria and library buildings is underway and will continue into the fall. When staff and students return in late August there will still be construction fencing around some of the site and areas of exposed ground that are being prepared for landscaping. Completion of Phase 3 is set for January of 2018. Roosevelt has two roof-top solar panel installations and some additional window awning installations for a total capacity of 134.79 kW. of generated electricity. Since their installation, the solar panels have provided the equivalent energy savings of 58 vehicles being taken off the road or 249 trees being planted and has prevented nearly 7,650 kg of carbon dioxide emissions (the main culprit in climate change) from entering the atmosphere. Work on the historic 1921 building – phase 2 of Roosevelt’s modernization - is picking up steam. The hanging of drywall on the ground floor of the west wing is now complete with taping and finishing of the walls now underway. On the first floor, west and south wings metal stud walls are now starting to be covered with drywall. In the east wing’s first floor, structural steel framing is now complete and plywood floor sheathing is being completed. Drywall has been added at the underside of ceiling to act as a fire barrier. On the second floor of the west wing interior walls are now framed and mechanical, electrical, and plumbing rough-in work is now underway. The south wing of the second floor is being mechanically roughed-in and fire sprinkler installation is underway. On the east wing, installation of drywall is underway at the ceiling level. The Common’s area is now dried-in with the roofing and skylights completed. The concrete stairs and step seating are also finished. The Common’s outdoor courtyard is being excavated for concrete footings. These will be poured within the next couple of weeks, weather permitting. The historic 1921 building is set to reopen at the start of the 2017-18 school year. On March 16, the RHS Theatre program had a ribbon cutting ceremony celebrating the opening of their two new modernized theaters. The event included a pre-show reception that honored alumni and donors and a tour of the new Bond funded performing arts facilities. The ceremony was followed by the premier of the Social Justice Theatre Project, a student created production that shared the stories of underrepresented students through theater songs, film, and other media. A video about the two new Roosevelt theaters is available here. Phase II construction work on modernizing the 1921 building continues to make progress every day. On the ground floor, wall framing and mechanical, electrical, and plumbing rough-in for the classrooms on the west wing have been completed. All new concrete seismic shear walls have been completed. Plywood diaphragm floor sheathing is nearing completion on the entire floor. Metal stud framing and mechanical, electrical, and plumbing rough-in is nearing completion at the South first floor, where the main offices and attendance are housed. On the same floor, concrete beams and columns are being formed for a science classroom and a science lab in the west wing. The east wing, where new career resource center, child care center and a mediation office will be located, scaffolding is in place to transfer building load before new fireproof steel beams become permanent structural members of the building. On the second floor, plywood diaphragm floor sheathing is nearing completion, as well as structural steel framing. Exterior work on the 1921 building including window restoration, and masonry veneer restoration is 50% complete. In the new commons area, contractors are working on the concrete stairs, roof membrane, and skylight installation. At the end of Winter Break Roosevelt staff and students returned to a campus that had once again been transformed. This January, several new spaces are opening including the Writing / Digital Media and Publishing Center, a state of the art Theater, Black Box theater classroom, new Band Room with practice spaces and the new Commons / Cafeteria with its new kitchen facilities. The new Commons, a favorite of the students, will serve as a community gathering space and open learning area. Band teacher Jason Margolis was thrilled to return from winter break and move into his new space. “It’s like the holiday season keeps on giving.” He said enthusiastically. I’ve been dreaming about this day for months. The completion of these spaces completes Phase 1B of the Roosevelt Modernization. 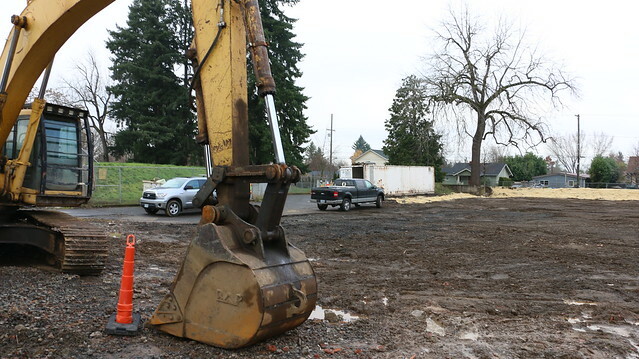 Phase II, underway since this summer, will fully renovate the historic 1921 Building, that at completion will include: new classrooms, the Main Office, Counseling Center, Family Room and Albina Head Start. Seismic sheerwalls will be completed this month and structural framing will begin on the ground floor of the West wing. Significant progress has also been made on the extension to the Student Commons area. After the first of the new year, several new and modernized spaces will become available to the staff and students of Roosevelt. In the Black Box theater interior finishes are complete and soon fixtures and equipment will be installed. In the new theater, lighting and stage rigging have been installed. Drywall and finished paint is occurring throughout the space and the decorative sound baffles, that utilize some the former auditorium’s wooden seats have been installed. The flooring for the stage is going in this week and the new theater seats have been delivered and will be installed in the coming weeks. The new Band/choir room is substantially complete. Its floor has been waxed making it ready for furnishing. In the Journalism and Writing Center/Digital Media Space flooring and finish painting is taking place. New furniture will be installed in the coming weeks. In the new commons / kitchen the new ventilation and exhaust system has been put in place and kitchen appliances are being installed in the coming weeks. Near the end of the month, Roosevelt’s existing kitchen facilities will be moved from the old kitchen to the new commons/kitchen in preparation for its opening after winter break. Abatement and demolition at the 1921 building is now complete. Major load-bearing concrete shear walls have been installed in the West Wing. Sheer walls in the South and East Wing will be poured in the coming weeks. These new shear walls will greatly improve the seismic safety of the modernized building. 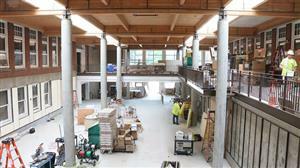 Outside in the new commons courtyard, glue laminated beams have been raised and fixed on the first-floor columns. Skylights are scheduled to come in early January, 2017. The Roosevelt High School Modernization project continues to move forward with more new buildings preparing to come online soon. Interior finishes at the Black Box theater space are complete. The Black Box is currently staged with furniture, fixtures and equipment (FFE) for the auditorium which is planned to be available after winter break in early 2017. Substantial progress has been made in the auditorium. Drywall is going up and lighting and stage rigging will be brought in by the end of November. Floor finishing and carpeting are expected to be complete in early December. In the band/choir room workers are painting interior walls and laying down flooring. It is scheduled to be furnished during the winter break and open for class in January 2017. Dry walling and ceiling installation are in progress in the Journalism & Writing Center/Digital Media space. It too expected to be open after winter break. Work on the new commons and the commons kitchen is finishing up. Students and teachers will likely see a brand new cafeteria with spacious dining area in the east wing when they return for Spring Semester 2017. Renovation at the 1921 building is well underway. Abatement work and demolition are nearly complete and concrete sheer wall construction is proceeding. The sheer walls will bring the historic building up to modern seismic safety code standards. Unforeseen conditions, such as uneven floor elevations and unreinforced masonry provide the project team’s engineers and architects with challenges to meet but the work proceeds on target. In the next couple of weeks, the construction team will continue to work on structural improvements of the historical building. Students and staff are enjoying a new Roosevelt knowing that even more buildings will become available just after winter break and again next fall. Work is moving ahead to complete the Auditorium, Black Box Theater, the New Commons and the Band room. These are scheduled to open after winter break in early 2017. In September, the Auditorium saw interior framing, with taping, and painting in progress. Interior finishes were also ahead moving ahead in the New Commons. In the Black Box Theater rough-in work took place. In October work on renovating the 1921 building really ramped up. A majority of the historic building has been abated and it is close to 80% complete on the demolition phase. Seismic upgrade work is also underway with the construction of sheer walls throughout the structure. These will help bring the nearly 100-year-old building into compliance with modern seismic standards and significantly improve the overall safety of the building in case of an earthquake. Throughout October the New Commons interior finishes will continue to move forward with substantial progress taking place over the next few weeks. Kitchen work is taking place this month with new stainless equipment starting to be installed towards the end of the month. The Auditorium and Black Box are also moving forward with interior finishes with some rough-in work continuing. Stage rigging for the new auditorium should start towards the end of October. The new Band Room area is in interior finish mode and this will continue into the next month. When school starts in late August, students and staff will return to a transformed Roosevelt. Several brand new buildings will be ready including the two court Main Gymnasium and the school’s first Auxiliary Gym, a weight room, 33 general education classrooms plus several Career Technical Education (CTE) Classrooms that will house Industrial Arts / Construction Shop, STEM / Robotics Lab and the Writing / Digital Media / Publishing Center. Three new community program spaces will also be housed in the new facilities. These are the School-Based Health Center, Clothes Closet / Food Pantry and the SUN / STEP UP Offices. Renovation work is complete on the former auditorium building, which will now serve as the new Media Center / Library with many new classrooms below. In just a few months, additional new facilities will open. These include the new Commons / Cafeteria, Band Room, state of the art Theater, and the Black Box theater classroom. With the safety of students and staff being the highest priority, some revisions have been made to the building turnover plan that will impact the new Commons / Cafeteria, Band Room, Theater and Black Box theater classroom. These programs and activities will instead remain in the existing Cafeteria wing on North Central & North Ida for the Fall Semester. Due to the necessary positioning of a high-boom crane necessary for renovating the historic 1921 Building, the decision was made to postpone opening the new Cafeteria / Commons and Band Room in the Fall. This was done to ensure the safety of students and staff due to the swing radius of the crane, as it brings in materials for the renovation. The location of the historic clock tower makes alternate positioning of the crane impossible. To view the previous project posts visit the RHS Modernization Document Archive page. Phase III construction - final demolitions, site work and landscaping began this summer and will be completed by January of 2018. There are some site restrictions as areas of the campus remain fenced off. For general information about school building improvement bond projects email the Office of School Modernization. Bassetti Architects is the Architecture Team for the Roosevelt High School Modernization. Bassetti has a strong background in both educational projects and historic buildings. The contractor for the project is Lease Crutcher Lewis.